Once again the world was getting excited about something that has been common practice for decades in the Netherlands. It was worldwide news earlier this year: Paris was to allow cyclists going through red lights. “It’s enough to make motorists see rouge!” was one such headline. But when you look a bit further it turned out to be only a small scale experiment. There was more swollen language: “Paris is to become one of the first major capital cities in the world to officially allow cyclists to ride through red lights”. Nonsense of course! Already a year earlier Belgium had changed their law*. Effective from July 2011 cyclists in Belgium are allowed to take a right turn on red, if there is a sign allowing them to do that. The step in Paris was described as a ‘radical measure’, but is that really true? We are talking about a very small scale experiment at only 15 traffic light controlled T-junctions in 30km/h (18mph) zones. In a trial period cyclists are allowed to go through the top of those selected T-junctions on red. But they will be held responsible in the case of a crash. Sign in the Netherlands regulating the free right turn on red for cyclists. From June 1991 this is a legal option in the Netherlands. So what is the situation in the Netherlands? Here it has been in the law since 1991** that road managers can allow cyclists to turn right on red if they put up a sign that says: “Rechtsaf voor fietsers vrij” (Free right turn for cyclists). But that is not all, in reality the Dutch can turn right on red and go through red at a T-junction at almost every bigger junction! This is possible because the Dutch (unlike the Danish) continue their separated cycle tracks at junctions. Their design facilitates going through the top of a T-junction or turning right without anyone really noticing it. No law was needed for it, nor any experiments. The nature of the design of the cycling infrastructure simply makes it possible in a very safe way. It is so common that even the Dutch themselves don’t realize this is how they do it. The design of cycle tracks in the Netherlands makes that cyclists can ride past red lights very often, especially at the larger junctions. It is interesting that in France and Belgium the measures are only legally acceptable in 30km/h (18mph) zones. 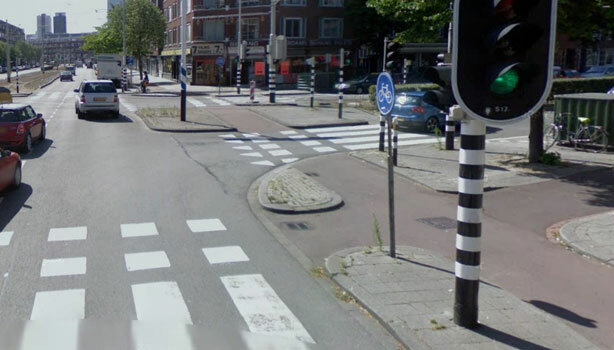 You will have to look very hard to even find a traffic controlled junction in such zones in the Netherlands. In those zones speeds and traffic volumes are so low that traffic lights are not needed. 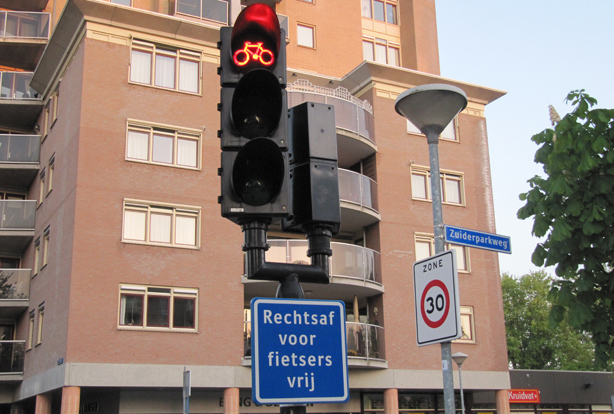 In the Netherlands people on their bicycles can cycle through (or better ‘past’) red lights on the major through roads where it is even more beneficial. You can make much better average speeds when you do not have to stop so often. The Paris experiment is expected to be studied by city and town planners across the world. At the risk of sounding smug: wouldn’t it be a better idea to study the system of the Netherlands, that has been in place at thousands of junctions and that has been perfected over decades? Obviously in countries with a high sense of ‘them vs. us’, cyclists ignoring red lights causes a lot of controversy. But in the Netherlands the feeling generally is: if a traffic situation leads to cyclists ignoring red lights without causing danger to themselves or others you should legalize that, because it helps to get cyclists to follow the rules at places where you really need them to do that. If you’d like to see a further analysis of the Dutch system there is an excellent article by two students of Northeastern University in Boston that was written for the summer course by professor Peter Furth in 2011. Quite often people express concern that because of the Dutch junction design and the separate green cycles, cyclists waiting for a red traffic light would block the way for cyclists riding in other directions that have green. That is generally not the case. The following five pictures explain that more clearly than I could in words. Dutch Junction design: the cyclist waiting for the red light in this picture does not block the way for a cyclists going straight on, that path is clear. 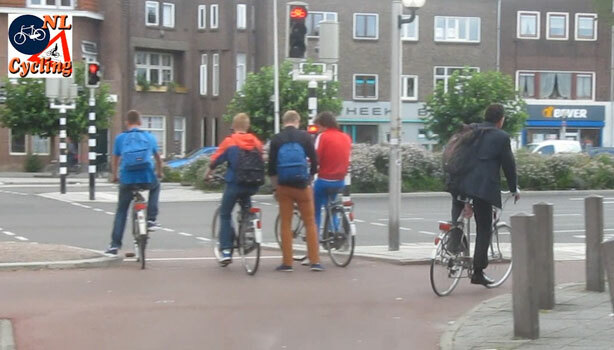 Dutch junction design: the cyclists waiting for a red light to go straight on, do not block the path of the cyclist turning right behind them. 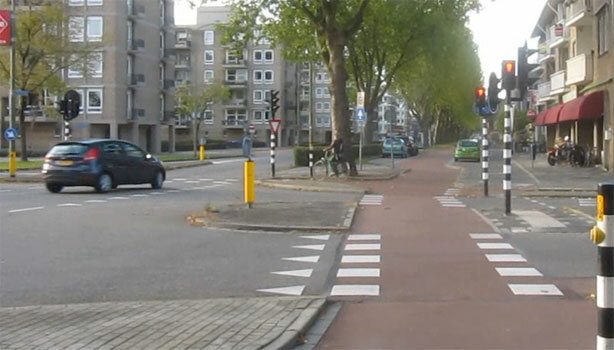 Dutch Junction design: another example that there is more than enough room for a turning cyclist to do so behind a cyclist wanting to go straight on who is waiting for a red light. Also, cyclists coming from the left and going to the right could easily pass behind the waiting cyclist. 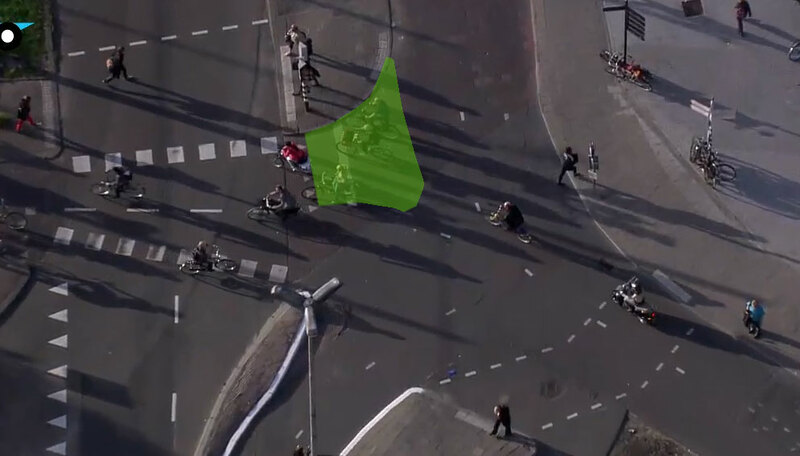 Dutch Junction design: from above it is clear to see that the waiting area (here highlighted in green) is big enough for at least 6 cyclists to wait in, without being in the way of any other cyclist. Dutch Junction design: again, the waiting area right in front of the light is big enough. It is at least one bicycle length long and 3 to 4 bicycles wide. Cyclists coming from the front left of this picture and going to the right can easily pass behind cyclists who would wait in that waiting zone. Only when there are more than about 10 cyclists waiting things will become too crowded. That does happen in some Dutch cities now, so a so-called scale-jump in those particular places is wanted, but in general there is no problem. * And I consider Brussels to be a major capital city. ** The law can be found in: “Regeling Verkeerslichten“, first effective on 28 June 1991, paragraph 2, article 28 a, b and c.
The document in “** The law can be found in” …. was deleted. Amsterdam is a major capital city and it allows people to cycle past red lights and has for decades. Wow! This unique fact about Netherlands is without doubt going to be very interesting for the rest of the world! However, while Dutch cyclists cycling past red lights look safe and natural because of the unique design of the cycle tracks at junctions, it was a purely foolish for France and other countries to replicate the concept. This is, after all, related to the lives of countless people who hit the road on a variety of vehicles on a daily basis. A nice and highly informative read! Thanks for elaborating on the red-light bicycle rules. It would be interesting to see your perspective on bicyclist + pedestrian interactions, especially at intersections with crosswalks given the red-light rules and also more generally between the two under high-traffic rush-hour conditions. “Past red lights.” What beautiful, paradigm-turning language. In Finland we have to obey traffic lights which are on the right of the lane or above it. Lights on the left do not apply. Cyclists can have a free straight (in a T-junction) or a free right turn if the path goes on the right side of the ligths as it often does. Recently, in some busy multilane intersections car lanes turning right are split from the left/straight lanes and have the traffic lights on the left. They’ll have a yield sign (or sometimes their own traffic lights) but can continue freely. Frankly, I hadn’t realized how big this advantage to have a separate path passing the lights is until I saw some cycling videos from the UK where they have to stop at every T-junction because they’re riding on the road. In California you can turn right or go through a t-section on a red light if you are a cyclist that stays on a bike path. Thats due to the bicyclist not being on the street, just like if you are a pedestrian on a sidewalk. California allows motorists to turn right on a red-light. Which introduces a common problem of a driver stopped at a red light only looking to their left in order to see iif a vehicle is coming, and if there is none, then they will start their turn before looking straight ahead or to the right. I almost got hit by a truck because the driver was still staring to his left when he moved forward after I stepped out onto the crosswalk.in front of him. I’ve learned to be very observant of the direction that a drivers head is turned when they are stopped next to the curb on a red light. It’s even more difficult transitioning from a bike path to the street or riding on a sidewalk and then going through a crosswalk (its legal to ride a bike on a sidewalk in most parts of Los Angeles). Another problem is that if straight through motorized vehicles have a green light, then they are also allowed to turn right at most intersections. This is at the same time that pedestrians are given a walk signal to proceed, even if its to cross a freeway on-ramp. Bicyclists that approach a intersection while riding on the street also tend to be to the right of motorized traffic. How motorists can be allowed to turn right on a straight through green signal on a busy street with a crosswalk is beyond my comprehension.. The idea seems to be that the motorist will see the cyclist, pedestrian or vice versa before they proceed. An example of how flawed this idea can be in practice is a street where the vehicle is proceeding up a incline for a couple of blocks at a high rate of speed and a pedestrian crosswalk is at the crest. The driver will probably not see the pedestrian until they are just a few feet away from them. This is the situation about six blocks south of where I live at an entrance to a freeway on-ramp. There is also the added problem if the pedestrian is blind. How will the blind pedestrian know that a vehicle is approaching and about to turn at a high rate of speed? Its dificult to imagine how this person could survive this situation many times without a seeing eye dog to guide them. I have to look behind me to judge speed and distance of the vehicles before proceeding at this crosswalk. Then I keep looking behind me towards the street as I walk forward. Its frequently safer to proceed into the crosswalk on a red light if no vehicles are coming. Its becoming obvious that these traffic control device standards were made with little regard for the impact that they would have on pedestrian safety. Steve Vance at Grid Chicago also recently pointed out that Germany has their traffic signals positioned on the near side of the street (seems to be the case for the Netherlands also), which is the opposite of the United States. The idea in the U.S. seems to be that having the signals on the far side will enable drivers to see when the lights turn green if they stopped close to the intersection. A few downsides to this is that drivers might feel more comfortable stopping later, they also will tend to encroach on the crosswalk more often when they stop knowing that they can still see the traffic signals. Also, Steve Vance observed that Germany typically uses less signals at an intersection than Chicago (Los Angeles is similar to Chicago in this regard). The reasoning behind more signals is probably that if drivers turn their head to the left, then they are still likely to see the signal..
One of the drawbacks to installing bicycle traffic signals here is the added cost. But, if less motorized traffic signals are installed, then that makes it more financially feasible for installing bike specific signals. Another problem in California is the free right turn allowed at some intersections. All vehicles can make the right turn without stopping under certain provisions. This can be exceedingly dangerous for pedestrians and cyclists as many drivers hardly even slow for these unless the cross road is clogged. Off-topic but contrary to the “fewest dollars in the here and now” idea: yesterday’s newspapers wrote that a major contractor to the Dutch highway builders has presented a plan for underfloor heating for busy cycle paths. Not as elaborate as in houses but still relying on pipes just below the path surface through which cold water is pumped in summer, which is then heated by the sun and stored in deep wells from which it is pumped up again in winter when the path is iced over or covered in snow. Cost about twice the cost of a regular bike path but it would presumably save thousands of accidents. The cities of Utrecht and Zutphen have announced their intention to run a test on their busiest cycle tracks. We may be in some sort of a financial crisis but this doesn’t prevent town councils from thinking ahead. One thing that British engineers cannot get their heads round is how to take bikes from a 20mph area or side road on to a segregated cycleway. If you want to do a blog instalment on this topic, I can send you some pictures from Colchester showing engineers’ efforts. Paris, Brussels and the whole of NL is way ahead of Sydney, Mark. Here we need to be very careful even going through the green lights. That’s true! It is scary for an average Dutch person abroad to find out that “green” does not mean a free path to go, as it mostly does in the Netherlands. We have many more separate phases than just two (north-south vs. east-west). So here green usually means: there will be no other traffic in your way. You must have experienced that here. 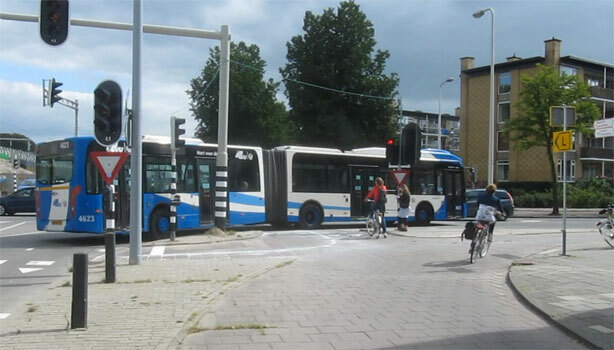 The Dutch style of having every movement controlled (at least at intersections that have lots of traffic) leads to less ambiguity about whose turn it is to go and who has the right of way. This will be somewhat addressed in Chicago soon when all right-turn channelizations are removed (right turn on red is allowed except where signed otherwise and no right-turn channelization has its own movement phase). This entry was posted on 25 October 2012 by Bicycle Dutch in Original posts and tagged infrastructure, junction design, protected intersection, red light jumping, right turn on red, traffic lights.